Are you wary of those who use the term “business optimization” to share strategies and tactics that produce suboptimal results? If so, you are in the right place. We are the global authority in Optimal Thinking, the basis of optimization. 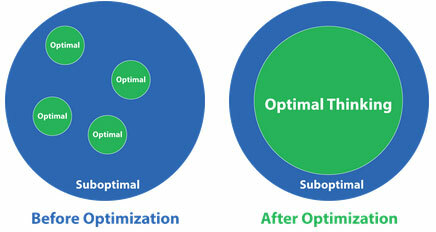 In the Absence of Optimal Thinking, Optimization is an Empty Promise. Our business optimization strategies maximize the performance of individuals, products and processes to best leverage technology and optimize organizational culture. We utilize proprietary assessments, executive coaching, and seminars to identify strategic and operational gaps. We then collaborate to produce optimal outcomes. Rate your Business, Business Leadership Skills, Organizational Innovation, Communication Skills, Business Processes and Product/Service Design, and Service/Sales Territory Management to optimize executive development and business performance. Our customized assessments are used by thousands of universities, more than 6500 companies, government organizations, and one million individuals. Experience our proprietary motivation strategies and “Get Motivated” seminars to achieve and sustain optimal employee motivation. Achieve business optimization by optimizing organizational culture change. Learn how to create an Optimal Thinking workplace where loyal, capable employees contribute their best, turnover is minimal, and value growth is doubled. Learn how to retain valuable employees who have accumulated job know-how and your organization’s intellectual property. Learn how to achieve business optimization from “Best Companies to Work For” award recipients. Maximize strategic analyses, innovation, and sound business principles with Optimal Thinking. Review several business optimization case studies and apply them to your organization. Business quotes to inspire you to make the best business decisions. Take the best actions to achieve your business objectives.